An enthusiastic audience were superbly entertained by both bands. Hawk Green Band opened the concert with a piece they played at a recent entertainment festival; ‘The Heat is on’, in which they gained 1st place. They then played 2 more pieces that from the contest. This was followed by a wide variety of music with solos from Hayley Cocksey on cornet and Gillian Spragg playing tenor horn. 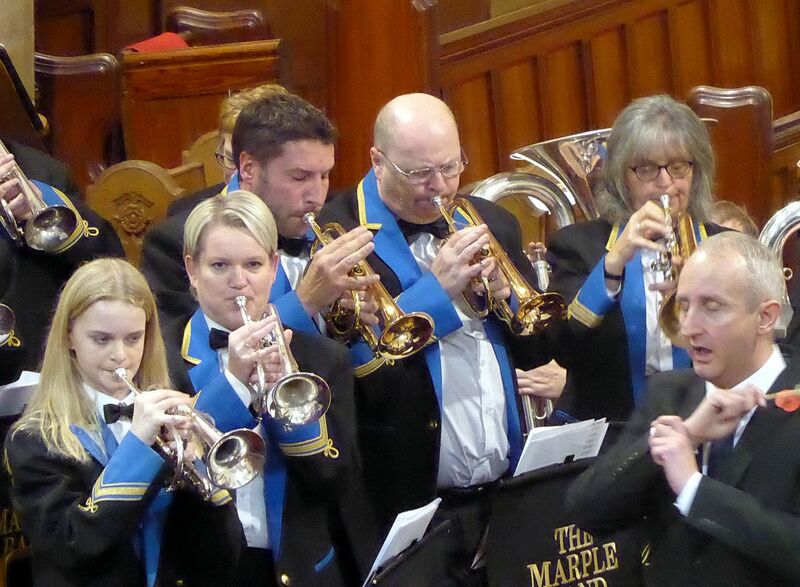 The second half saw The Marple Band play a selection of music that reflected the theme of the commemoration with ‘Aces High’, ‘The Dam Busters’ and ‘Magnificent Men in their Flying Machines’; all focused on the 100th anniversary of the RAF. Helen Sutton on Flugel Horn played ‘Magh Seola’ and then David Barker on Percussion played ‘The Flyer’. This was interspersed with some lively folk dance music- Armenian Fire Dance and Balkan Dance. The two bands then joined forces to play ‘Evening Hymn and Sunset’ conducted by Steve Curtis and ‘Fantasia on British Sea songs’ conducted by Neil Hewson. The congregation enthusiastically joining in for the singing of Rule Britannia. 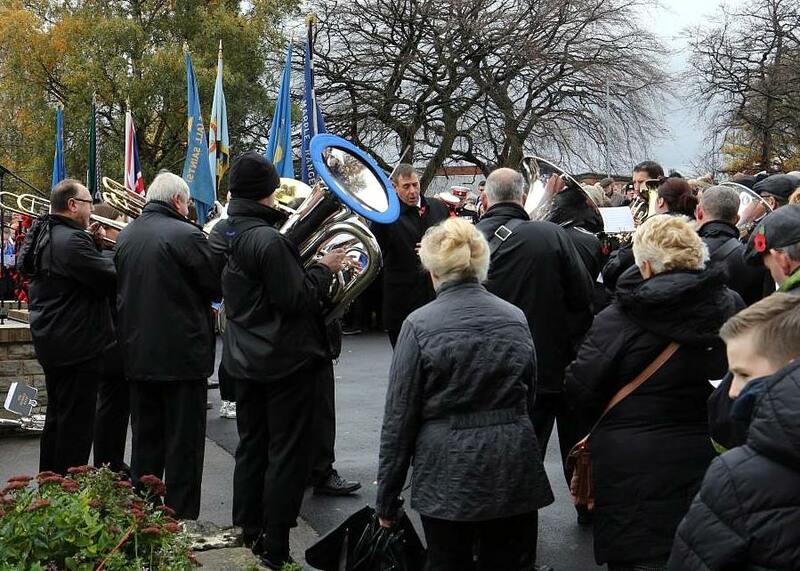 The following day The Marple Band were out once again this time to play at the cenotaph in Memorial Park with Andy Liles playing The Last Post. Throughout the service readings were heard from various organisations whose members were casualties of the 1st world War. Mike Jackson (The Marple Band President) represented the band to do the following reading. Private Raymond Pickford 235430 – 17th Battalion Royal Welsh Fusiliers had been a member of Marple Band and 6th Territorial Battalion of the Cheshire Regiment prior to the outbreak of war and was therefore immediately called up. Having served throughout four years of the war he was killed in action in the fighting for Villiers Outreaux in the Battle of Cambrai on 8th October 1918, just weeks before the war ended. Such was his bravery he was recommended for a Distinguished Conduct Medal and was posthumously awarded the Military Medal.